Dubai, April 21, 2015: The Chalhoub Group proudly presents the reopening of a brand new store concept at Tanagra, the quintessential ambassador of luxury lifestyle in the Middle East. This elegantly designed concept is now located on the second level under the Grand Dome at Mall of the Emirates. This new, innovative concept has enabled the brand to render a superior service, strengthening its position as one of the leading destinations for the style-conscious globalist who demands the very essence of artistic elegance and good taste. It is this process of innovation that has helped Tanagra grow into a well-known network of nine locations across Kuwait, the UAE, Bahrain, Qatar and Saudi Arabia from when it first opened in 1980. Now, shoppers at the new Mall of the Emirates location get to experience the best of the past as well as the present, with the rich heritage of Tanagra, while meeting the bolder, future-forward spirit of its current reinvention today. 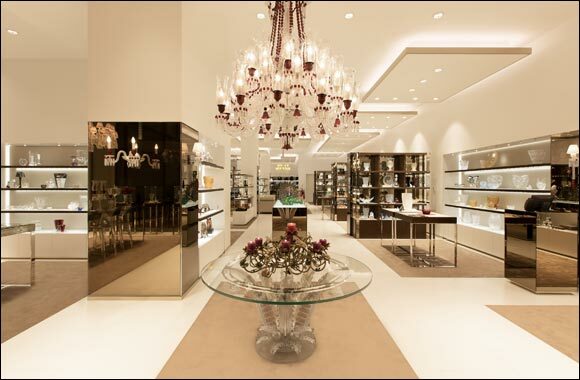 A walk through the marvelous boutique is reminiscent of the delight while unwrapping a luxurious gift. At first sight, the exterior of sharp lines with a soft metallic sheen is suggestive of a modernist museum, giving way to a plush interior with soft, sculptural lighting and designer furnishings. Designed as an abstract gift box, the stunning space invites further discovery and delight as shopping zones within offer the finest, most renowned names in silverware, porcelain, crystal and personal style essentials. Instantly recognizable and highly coveted names such as Baccarat (available on our mezzanine floor), Swarovski, Rosenthal, Vertu, Lladro, Lalique, Tumi and many more prominent new brands are here, such as RabLabs, Ateliers Des Ors and Histoires de Parfums. Florence Bulte, General Manager, says: “Our partnership with MyList, the leading online gift registry in the Middle East, allows us to offer an additional level of convenience and personalized service to our customers making us a preferred choice for gifting occasions.” The updated store concept offers a new organization and, arrangement of brands, to facilitate customer ease and enhance the presentation of a refined array of gift options. These include: Ralph Lauren Home’s crisp, classic take on American style; Klaus Dupont’s eclectic sculptural collages; Lafco’s scented House and Home Collection candles, Agraria’s luxury bath bars, salts and crystal candles, as well as gold-infused perfumes by Atelier des Ors. Also available are Moser’s stunningly crafted glass pieces, Anna New York by Rablabs trays, coasters, platters and bowls, and Visconti’s embellished writing instruments and watches. Cristal Benito’s enduring classics in hand-cut crystal are a must-see. Additionally, patrons will enjoy Roberto Cavalli’s flamboyant objects for the home, along with the stunning Limoges Porcelain collection from Picasso by Marc de Ladoucette. Baccarat’s Everyday Baccarat collection is a set of six perfectly cut crystal glasses, each with a creative pattern to be enjoyed every day. Ideal at any time to savour a drink from day to nighttime, the Everyday Baccarat box is the perfect gift for family and friends. Also in store is L’Objet, celebrated maker of artisanal home d�cor debuting its highly anticipated Fortuny collection, “Alchimie de Venise”, a stunning array of vibrant d�cor and tabletop that combines an ancient aesthetic with a modern craftsmanship. All this leads to one conclusion: a whole new identity that reflects three keys to the core ethos of Tanagra: Inspiring, Refined, Editor. Inspiring, in its fabulously thought-out, user-friendly new design, and the chance to view the latest trends in the inspiration zone, where new labels and product launches also take place. Refined, in its artistic approach to curating an exceptional collection that brings the best of beauty in craft and art to your home. And last, but not least, Edited, in that each item in store is remarkable for its selection based on industry insights into luxury, art, lifestyle and design.